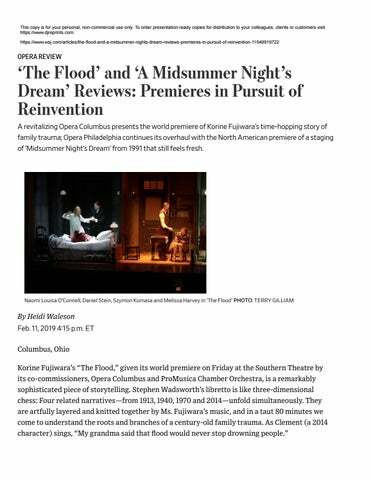 ‘The Flood’ and ‘A Midsummer Night’s Dream’ Reviews: Premieres in Pursuit of Reinvention A revitalizing Opera Columbus presents the world premiere of Korine Fujiwara’s time-hopping story of family trauma; Opera Philadelphia continues its overhaul with the North American premiere of a staging of ‘Midsummer Night’s Dream’ from 1991 that still feels fresh. The ﬂood in question is the 1913 inundation that destroyed Franklinton, a riverside neighborhood in Columbus, wrecking thousands of homes and killing more than 90 people. The opera’s 1913 action features Anna, who is dying from injuries she sustained in the ﬂood, attended by her husband, William, and their African-American servant, Frances. A century later, Clement’s daughter, Annie, wonders about her late mother’s secrets. Connecting Anna and Annie are the two intermediate vignettes: In 1940, Hans, who was Anna’s lover, and feels responsible for her death and those of his ﬁrst wife and children in the ﬂood, can’t help unleashing his grief and guilt on his 10-year-old daughter, Schatzi. In 1970, Schatzi is the adult Alice, a psychologist who has spent four years conﬁned in an asylum, grappling with the pain her father passed on to her. Alice was Annie’s mother and Clement’s wife; Frances was Clement’s grandmother. Despite its surface complexity, the story unfolds clearly. Charlie Corcoran’s evocative set places four small rooms, each with distinctive period details and colors (and Anita Yavich’s timeappropriate costumes), side by side. David Lander’s lighting and Mr. Wadsworth’s direction deftly shift the focus to whichever narrative is foregrounded at any given moment while subtly indicating how it relates to the others. Ms. Fujiwara’s accessible tonal idiom is similarly coherent throughout. While each “room” has its own musical personality, the poignant sections in which characters in diﬀerent periods actually sing together—a trio, a sextet, and even an octet—dovetail perfectly. The dramatic arc builds persuasively to the climactic moments, shifting with increasing speed between scenes to the culminating revelation. The ﬁne cast included Naomi Louisa O’Connell, who excelled in Anna’s two passionate, hallucinatory arias; Melissa Harvey, whose high, piercing soprano made her believable as the 10-year-old Schatzi; and Szymon Komasa, who was wrenching as the bitter, broken Hans. Amanda Lynn Bottoms brought a richly expressive mezzo to Frances. Kevin Deas (Clement) and Meroë Khalia Adeeb (Annie) shared an appropriately contemporary vibe; Lacey Jo Benter (Alice) seemed uncomfortable when the role ventured into higher territory. Daniel Stein was a careful William, and Robert Kerr and Bill Hafner were the two asylum doctors, both spoken roles. Conductor Steven Osgood drew a warm sound from the ProMusica Chamber Orchestra, which sounded bigger than its complement of 16 players would suggest, and skillfully managed the opera’s complicated vocal choreography. The company’s energetic general and artistic director, Peggy Kriha Dye, mandated a locally focused subject: The commission is part of her ﬁve-year eﬀort to rebuild Opera Columbus into a community necessity after a ﬁnancial crisis sidelined it for a while. Yet while the place names in the piece—Franklinton, the Scioto Mile, Poindexter Village—may resonate speciﬁcally with local listeners, the larger themes, and the inclusion of African-American characters, should give “The Flood” a reach beyond parochial borders. 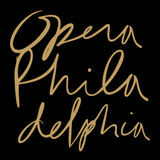 *** Philadelphia Opera Philadelphia is well into its own reinvention, with two successful season-opening festivals, O17 and O18, under its belt and a similarly genre-bending selection of productions and new work just announced for O19. Its February oﬀering, Benjamin Britten’s “A Midsummer Night’s Dream” (1960), is marginally more traditional than Opera Philadelphia’s festival fare: It is the North American premiere of a Robert Carsen production that has been making the rounds in Europe and even China since its ﬁrst appearance in Aix-en-Provence in 1991. Age aside, the show looked and sounded fresh and appealing at the Academy of Music. Directed by Emmanuelle Bastet and conducted by Corrado Rovaris, it emphasized the comedy rather than the darkness in Britten’s beguiling adaptation of Shakespeare’s play. The production’s clever theme is beds—for sleeping, dreaming, and making love. Designer Michael Levine’s Act I set is a single giant bed; subsequent acts replace it with multiple smaller ones, and the prevailing color is bright green, from the bedcovers, to the spiﬀy tailcoats of the fairies (20 excellent singers from the Philadelphia Boys Choir), to Oberon’s elegant nightwear and wig. The four hapless Athenian lovers start out in crisp white attire that looks increasingly grassstained as their ordeal escalates. A feast of vocal talent was on display. Tim Mead (Oberon) and Anna Christy (Tytania) made the fairy rulers’ squabble more a lovers’ spat than a war; his mellow countertenor and her stratospheric soprano sounded perfect for each other. The Athenians were distinctive as well: The contrast between Siena Licht Miller’s cello-like mezzo and Georgia Jarman’s ﬂuty soprano intensiﬁed the frenemy antagonism of Hermia and Helena, while Brenton Ryan (Lysander) and Johnathan McCullough (Demetrius) were hilarious as their bewitched swains. All the mechanicals were standouts. Bass Matthew Rose is a big man with a similarly sized voice and personality; you got why this Bottom thinks he’s the star of any show, but his cohort— Miles Mykkanen (Flute), Brent Michael Smith (Quince), Patrick Guetti (Snug) and George Somerville (Snout)—gave him competition. Miltos Yerolemou, in the spoken role of Puck, looked like a raﬃsh tout and used his tumbling skills and comic timing to traﬃc-cop direct the mortals toward their destinies. Puck gets the last word, but it was the double line of fairies, plucking on violins to accompany their ﬁnal chorale of blessing, who left the indelible visual and aural image. Ms. Waleson writes on opera for the Journal and is the author of “Mad Scenes and Exit Arias: The Death of the New York City Opera and the Future of Opera in America” (Metropolitan). Review of A MIDSUMMER NIGHT'S DREAM by Heidi Waleson in The Wall Street Journal, February 11, 2019.